A sincere thanks to all of our valued and passionate customers on this incredibly exciting day for us! 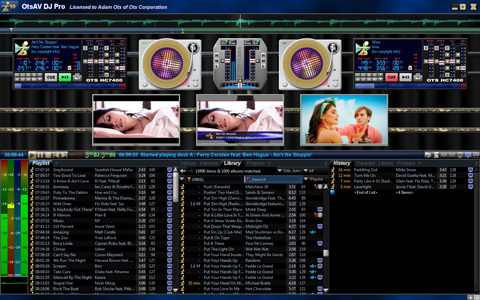 - OtsAV DJ Pro-Classic+ 1.85 [with free upgrades to 2.0] - note: NOT other types of OtsAV DJ licenses. - Anyone who purchased an OtsAV full license (not an upgrade) on or after July 18, 2011. (Though this category requires manual processing and some communication. Please stay tuned for further information shortly - and please resist flooding our contact avenues with questions about this as this will only serve to slow down everything for everyone. We will tell you what to do and when - as soon as we can; not long). For other license types; OtsAV DJ Silver, OtsAV Radio Webcaster, OtsAV TV Webcaster, and versions earlier than 1.85 or other products such as OtsTurntables - we'll be announcing a limited-time offer shortly and also regular pricing for these upgrade paths. Again, please afford us some space as we are already being innundated with highly irregular volumes of traffic. Thank you. If you are unsure which license type you have, take a look at My Licenses at OtsZone (you'll need to log in to your OtsZone account). For new license purchases, check the order page. If it's not yet fully updated, please try again shortly. Thanks for bearing with us while we transition everything between 1.85 and 1.90. If this is the first section you skipped to, then you're very naughty and really should go back and read this entire page. No. We're actually serious. Of course we hope and trust that the vast majority of users will be extrememely satisfied - particularly once they understand the benefits. However... As a company we have a lot of experience and history to go on in releasing our efforts upon the world. One thing we have learned is that whatever we do - and indeed this is of course true at large - there will always be those that aren't satisfied. For some, it's simply a case of change hurts (really, this is basic human nature). Often after a little time exposing themselves to the new concepts and ideas they come around and begin to see the tremendous increased value in whatever area you wish to speak of. For others, it may simply be that their priorities are a little different and weren't met on any given occasion. We all want what we want, right? If you find yourself not really enamoured with this release, keep in mind that this is but the first of a series of Esperance releases and it may well be that the concept comes together and begins to make sense after a little time. For us, our goal is simple: to please as many as we can while working on what we love and believe we're good at. We're extremely passionate about what we do and we seem to attract customers of the same ilk! Passion is certainly a great driving force. But we must all remember the basics. Everything is built one logical step at a time and no matter what you do or what transpires you won't please everyone 100% of the time. This should not dampen the passion and if you've bothered to read this far then you really must have found at least something you like in this little community we call Ots.